On July 6th 2016, Prof. Branka HORVAT, the Research Director of International Center for Infectiology Research (CIRI) in French National Institute of Health and Medical Research (INSERM) visited WIV, and gave an academic talk on “Emerging contagion: Immunopathogenesis of Henipavirus infection and novel prophylactic approaches”, which was presided by Prof. Zhengli Shi, to the teachers and students in our institute . In the report, Prof. HORVAT introduced that Nipah virus (NiV) and Hendra virus (HeV) are highly pathogenic neurotropic zoonotic paramyxoviruses of Henipavirus genus that cause human outbreaks in South-East Asia and Australia. Fruit bats are natural reservoir for both viruses, presenting only asymptomatic infection. Similarly to previous Ebola occurrences, Henipavirus outbreaks remain sporadic until now and seem to affect only small areas; however, they may have a global pandemic potential and present an agents of particular concern in the field of human and agricultural biodefense. Immuno-neuropathogenesis of this recently emerged viruses is still poorly understood and licensed therapeutic and preventive options are still missing. Although lymphocytes are not susceptible to Henipavirus infection, they bind efficiently the virus via heparan-sulfate and transinfect susceptible cells. The research group led by Prof. HORVAT has analyzed different type of mice, bearing defects in either innate or adaptive immune system, for the susceptibility to NiV infection and development of fatal encephalitis. In contrast to wild-type, mice deficient for type-I interferon (IFN-I) receptor were highly susceptible to NiV. Although viral sensing through either TLR or RLR alone was not critical in anti-viral defense, mice devoid in both TLR and RLR signaling succumbed to the infection, with similar survival rate as IFN-I deficient mice. Furthermore, depletion of macrophages allowed rapid systemic propagation of NiV infection and high lethality in mice, suggesting their important role at the crossroads between innate and adaptive immunity. Finally, they have demonstrated the efficiency of Canarypox recombinant vector expressing HeV glycoproteins as a new vaccine candidate to confer protection against Hendra infection. Their results suggest that this novel ALVAC-based vaccine presents the potential for breaking the chain of HeV transmission from bats to horses and then to humans, thereby protecting both animal and human health, and integrating thus into One Health approach. The EMERGENGES 2016 Program launched by the French Embassy in China supports French-Chinese cooperation in emergent infectious diseases, which is dedicated to strengthen the visits of French colleagues in China. 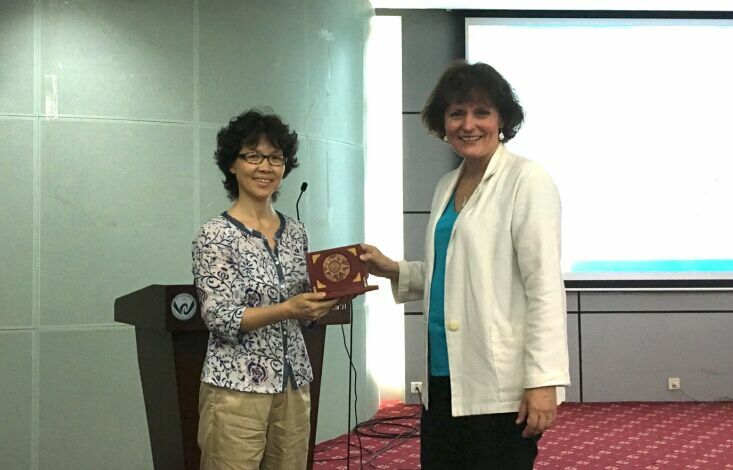 Prof. Branka HORVAT is selected as a French representative under this program to visit China in 2016. The EMERGENCES 2015 Program allowed 10 Chinese confirmed researchers to visit French infrastructures dedicated to infectious diseases and to discuss face to face with colleagues about their research projects and future potential collaborations. Among the 10 2015 laureates, Professor Hong Tang, Professor Zhengli Shi and Professor Bin Wei in WIV paid a visit to INSERM and Institut Pasteur last year.